We’re witnessing an amazing shift in terms of how people are relying on web, social networking and mobile technologies. And that changes everything for healthcare providers in terms of how they reach, engage and communicate with healthcare consumers and patients. The rise of smart phones and tablets such as the iPhone and iPad have put information, communications and commerce just a click or voice command away. Digital strategies must move beyond the hospital website and Facebook page, to a fully integrated approach for reaching and engaging consumers, supporting patients with care management, facilitating workplace communications and promoting clinical decision-making. A comprehensive web, social and mobile capability, integrated with clinical IT systems such as EMR and patient portals, and embedded in physical environments , is no longer optional for organizations that want to remain relevant. Today, consumers don’t have purely offline or online experiences. They weave technology through nearly every point of contemplation, purchasing and use of products and services. People may get healthcare in the physical world, but some of their best data, decision support, buying and communications tools exist in the virtual one. More than ever, patients are seeking healthcare information, sharing experiences and selecting treatments and providers online. Over 80% of the U.S. population gathers health information online. 55% of internet users look online for information about medical treatments or procedures. 66% of internet users look online for information about specific diseases or medical problems. 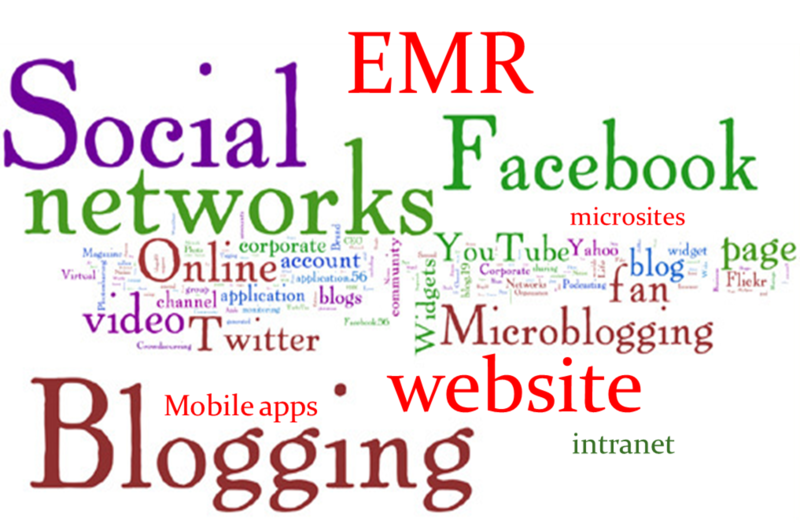 Terms like eHealth and mHealth are used to describe healthcare practices supported by the internet or mobile technologies. Videoconferencing, remote monitoring and tracking devices for patients with chronic disease, electronic health records, on-line consults, and health topic chats and support groups are just a few of the ways technology is being used for care delivery purposes. Industry investments in the application of these technologies for purposes of healthcare are significant and projected to increase. We can expect these to be important components of future delivery models where patient engagement and cost effectiveness are crucial aspects of performance. Marketers can be change agents in helping health systems, physicians and other providers better understand how to employ these technologies. Many have had a head start by integrating digital technologies with traditional communications tools to engage stakeholder audiences. And marketers have the communications expertise to influence consumer perceptions and behaviors. What it will take is a stronger marketing, care delivery and operations partnership. But, oh, the possibilities. The contributions of the nominated organizations and individuals to the industry must be extraordinary and far exceed what might be generally expected or accepted. Candidates selected by the Board of Judges will be individuals or organizations that clearly standout from the mainstream, and whose work and accomplishments distinguish them from others working in the same field. The Healthcare Internet Hall of Fame was established in 2011 to honor men, women and organizations that have made outstanding, long-lasting contributions to the healthcare Internet industry. The organization’s purpose, while honoring innovation, is to ensure that the “history” of the industry is preserved for future generations new to the healthcare industry. Although initially organized by Greystone.Net, the Hall of Fame is an independent organization whose annual inductees are selected by an independent Board of Judges. Inductions are made at the Healthcare Internet Hall of Fame luncheon during the annual Healthcare Internet Conference. The 2011 inductees were John Eudes, co-founder of Greystone.Net, Dartmouth-Hitchcock Medical Center, Sharp Healthcare, Epic, Estrada CMS and WebMD. Click here to read more about their accomplishments. So, who would you nominate?